An afternoon with the girls. A few weeks ago when I had it brought to my attention there was a hawk hanging out in the back yard, I ran down to Brian’s to warn him just in case the chickens were wandering about the yard. You see, the chickens that I often claim as my own live in Brian’s back yard. I wanted chickens. Brian had had chickens before and had a coop. I worked out a deal with Brian where we helped rehab the coop and share responsibility for the chickens, but they live in his yard to save us from having to repurpose the tiki hut or build another structure in the back yard. Before he got his back yard fenced off, they would wander over here and sometimes Marsha still does. 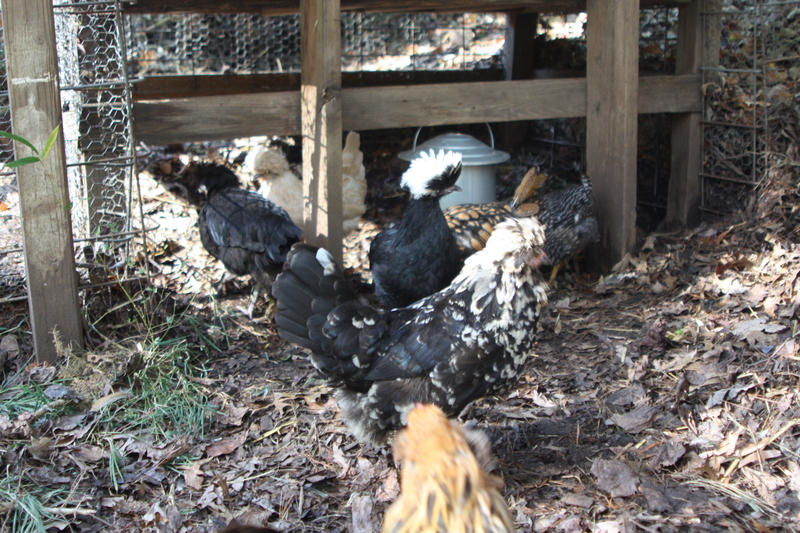 I throw them my scraps – they eat well during canning season – and we get fresh eggs. I have become spoiled by the quality of eggs they lay with their happy orange yolks. Once you’ve had a backyard egg, you realize that grocery store eggs, even the ones labeled free range, are flavorless. 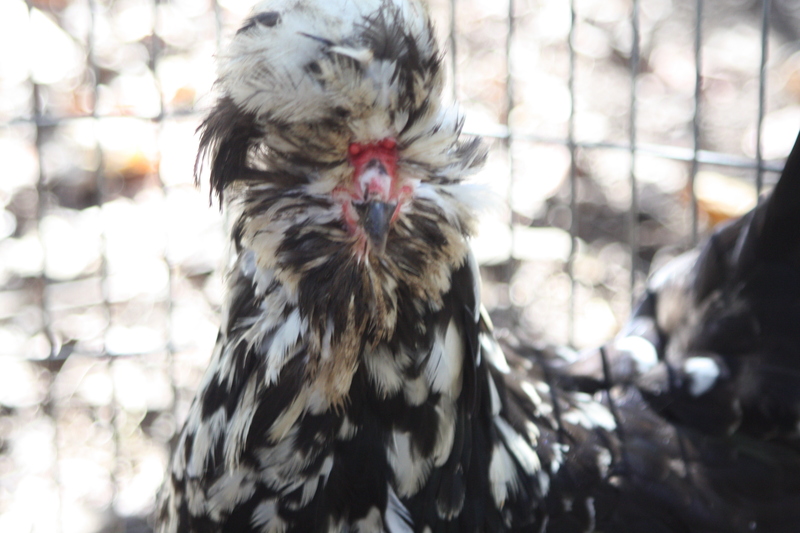 Marsha, the free spirited free range chicken. 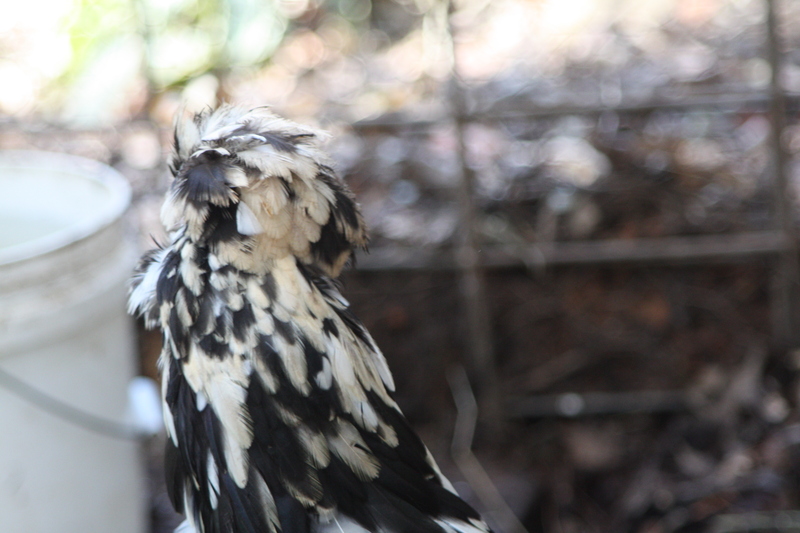 When I went down to Brian’s the day of the hawk, I was quite excited about the photos I had gotten of the hawk. He reminded me that I had not taken any photos of the girls lately and with them having recently molted, several were looking particularly photogenic. 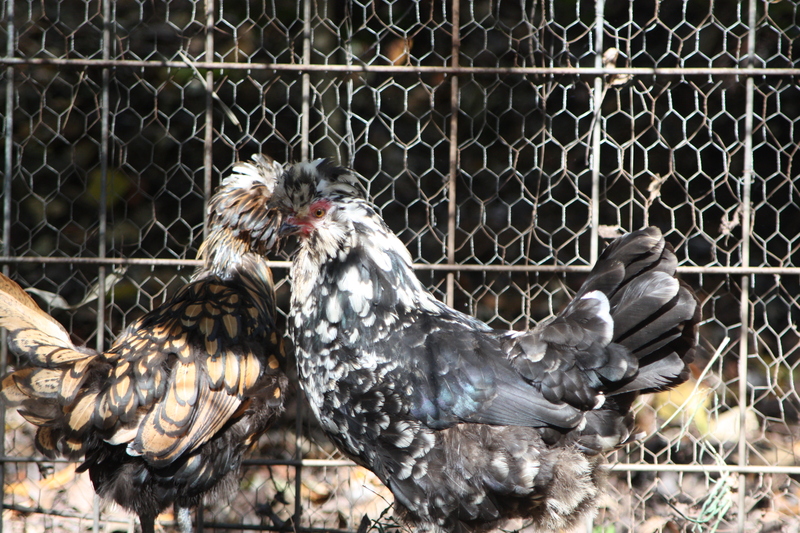 We have all ornamental layers, which I frequently refer to as our funky chickens. All told, there are 9 chickens, all hens. 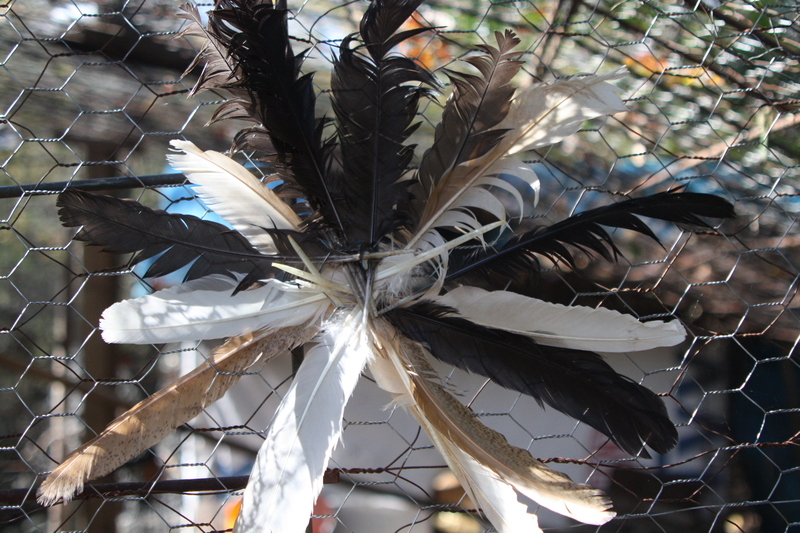 All but two have some sort of headdress. 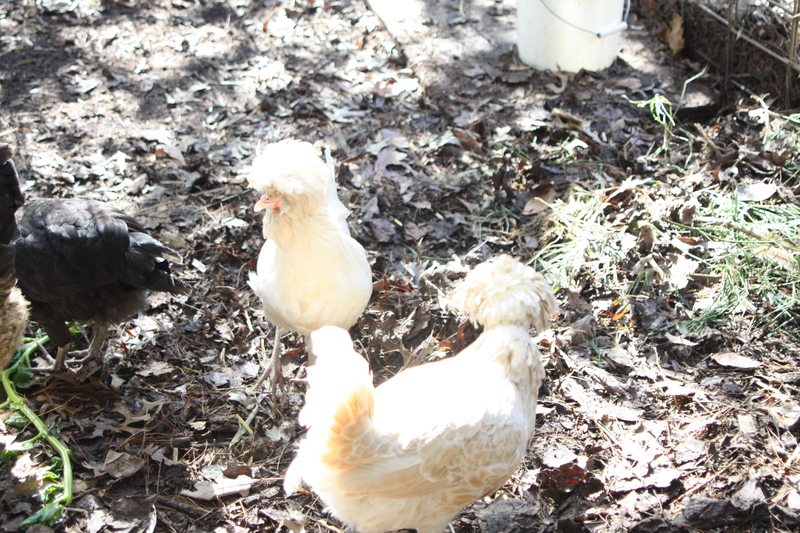 Edie and pals named a few of the chickens and Brian named the rest in honor of his sisters. Ozzy, named for Ozzy Osborne because of the appearance of her eyes when she was a fresh young chick, is Edie’s favorite. Ozzy is a sweetheart of a gal. 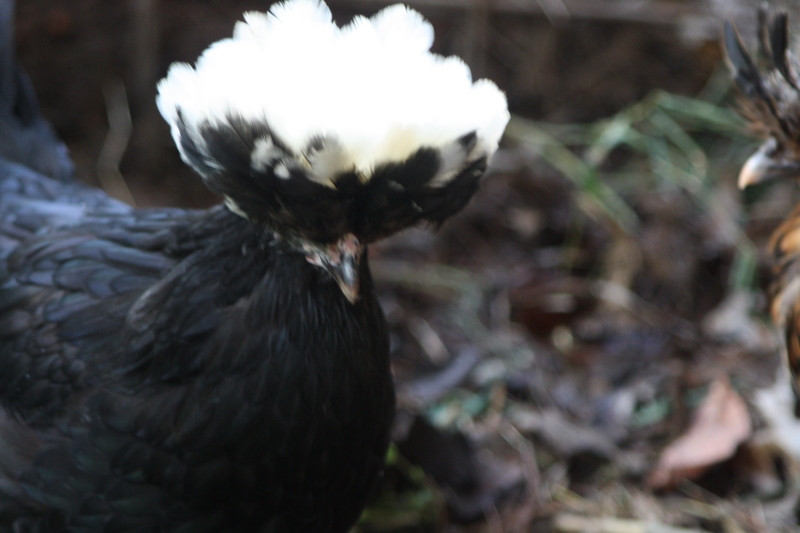 Her lopsided crest merely gives her character. Our first layer, she is our best layer. 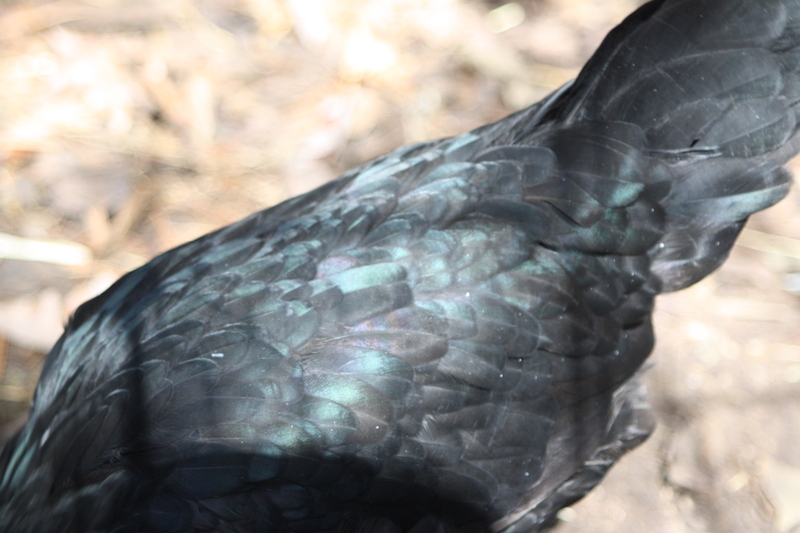 She lays green eggs and large ones at that. 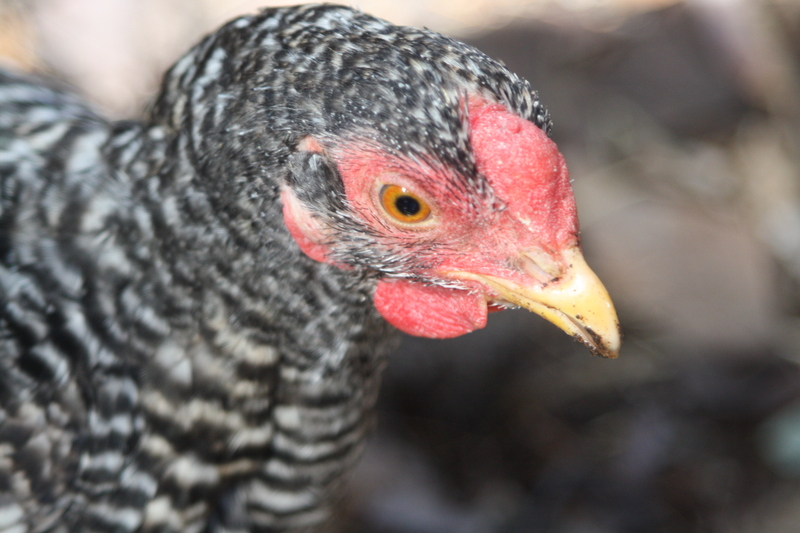 Chickens are social creatures and much smarter than they are given credit for. I highly recommend having a few in your back yard. Although, be warned, come the end of July beginning of August when everyone is on vacation and Edie is at camp and Pat’s on the road for work and you are home alone all weekend with the chickens, even they will insist you find someone else to talk to. 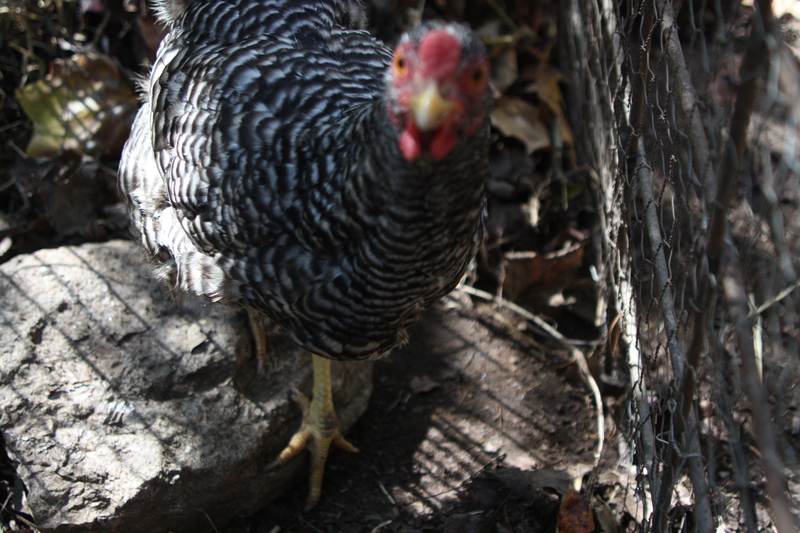 Taking pictures of chickens can be challenging. They are fast little buggers. They like to cluster up. When they see me, they equate me with food. They tend to come running up, chatting away. Ozzy is the most vocal of them all. You think you’ll have a shot and then bam! the chicken moves. Having chickens with Brian has meant that instead of reading about chickens before getting them, we were able to just jump right on in. As much as I love to do my homework before jumping into projects, I also just love jumping into projects. 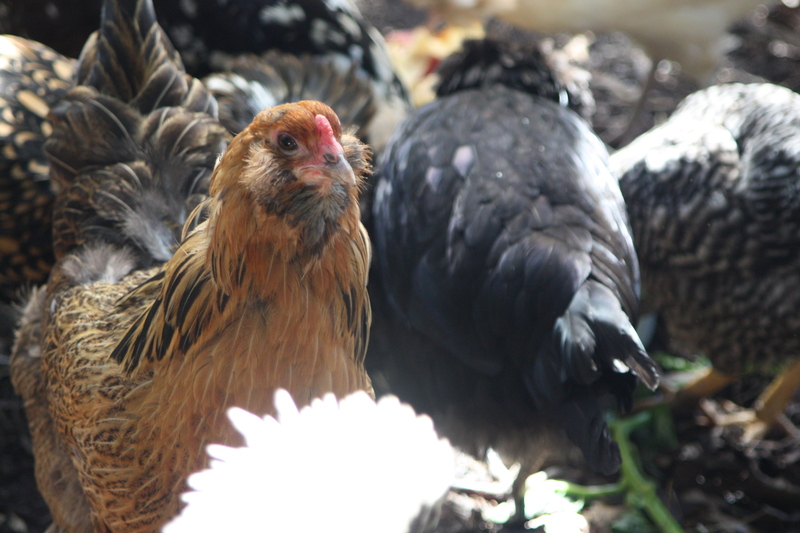 And the amount of information out there about chicken keeping overwhelmed me to be honest. People have raised chickens for how long? Surely it couldn’t be that hard. There are some things to know and keep in mind, but Brian, having had a few flocks before, knew exactly what to do. Neighborhood chickens, I highly recommend them. 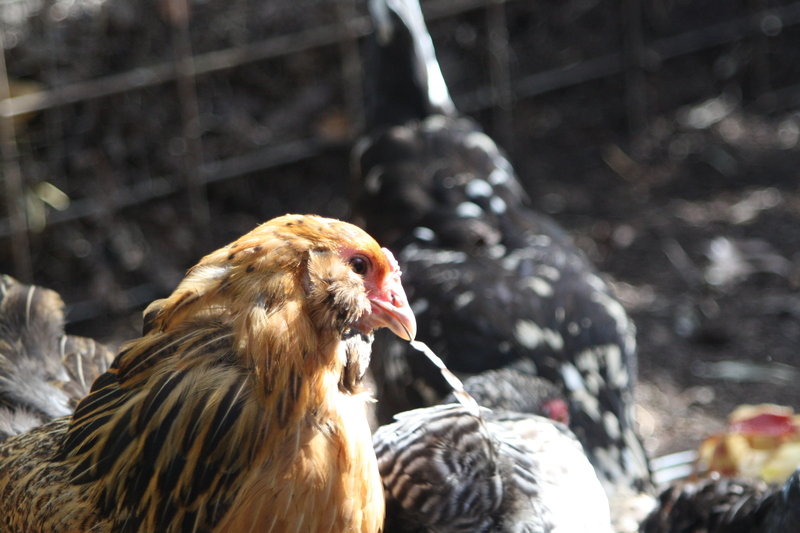 When we move to the country, I want chickens…and the pretty kind like yours and Brians! 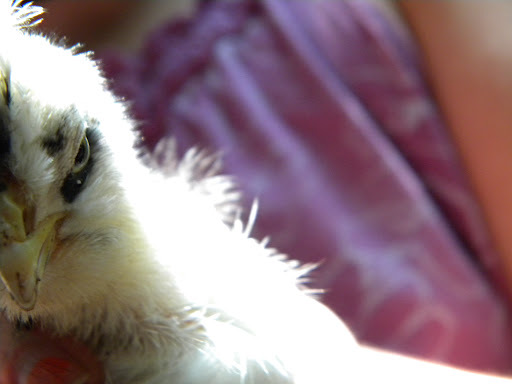 And yes, fresh eggs truly are the best! 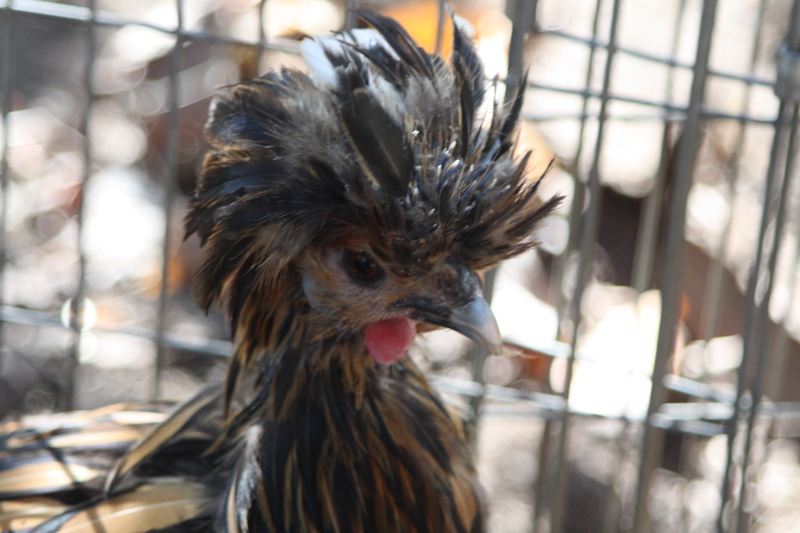 You can have city chickens like we do! I’m pretty sure those are the most beautiful chickens I’ve ever seen. You have also inspired me to see if I can get my neighbors to have chicken on our behalf. I want them…in someone else’s yard. Neighborhood chickens are the best. I highly recommend them! Thanks! Sitting in a chicken coop for a bit helps. We’ve talked about having a community coop for the households on our block, but it hasn’t happened yet. Your chickens are lovely. Michelle could be a part time model. Her tail is a little left-leaning though (which is why she is named Michelle – after the First Lady! ).